Dr. Meggan Moorhead is a Clinical Assistant Professor in the Department of Psychology at the University of North Carolina at Chapel Hill. She is a Clinical Associate at Duke Medical Center. She is currently co-director of a DBT Program Triangle Area DBT includes a program for High School Juniors and Seniors, undergraduate and graduate students, three stage one skills groups for adults, and three graduate groups. She is participating in a research therapy team at Duke for DBT with the depressed elderly. Dr. Moorhead is a graduate of Princeton and Boston Universities with degrees in East Asian Studies and Counseling Psychology. 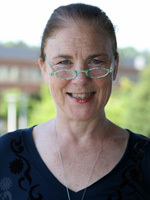 She trained with Dr. Linehan in the first national training of DBT at Duke and Cornell Universities. Her particular interest in DBT has been its meticulous theoretical and clinical attention to a highly respectful relationship with the patient. Dr. Moorhead was born and raised in Japan and has lived in South Africa. She was trained psychoanalytically in Boston, MA, as well as in North Carolina. She brings to her teaching of behavioral principles and skills an ability to be sensitive to diversity across cultures and languages.